School is in session, fall is in the air, and the all-London-all-the-time media blitz of the Olympics and Paralympics are but summer memories. Nonetheless, I just can’t seem to shake a certain longing for more London. For those in the same boat, please allow me to suggest another route back to a London state of mind: Make yourself a grilled lamb sandwich with the works, à la the Borough Market. It’s no secret that British food has developed light years beyond old-guard stalwarts like bangers and mash and beans on toast. Today British food is vibrant with fantastic artisanal ingredients, modern sensibilities, and ethnic influences from every corner of the globe. And nowhere is this phenomenon more evident than at the Borough. [%image reference-image float=right width=400 caption="A delicious sandwich from London's Borough Market, made at home. "]A huge wholesale market, the Borough is located in the Southwark section of southeast London, near London Bridge. On Thursdays, Fridays, and Saturdays, there's a retail market with producers from all over the country selling fruit, vegetables, fish, meats, charcuterie, ciders, cheeses, breads, coffees, cakes, pastry — you name it — in roughly 70 stalls. Of course, there's also lots of imported stuff, too. My sister turned me on to the Borough when we met in London during the year I lived in France. Captivated as I was with the fantastic French markets, I was utterly thunderstruck by the Borough, which is to the Paris markets as the Mall of America is to the mom'n'pop corner store. Three aspects of the Borough blew me away. First, the variety was incredible. Local British Isles cheeses (Neal’s Yard has a branch there) as well as huge displays of French, Italian, and Spanish cheeses. Herbs and spices of every stripe. Fresh-pressed pear and apple ciders. Homemade candies. The first haggis I'd ever laid eyes on. Organic meats. Fish that sparkled. Second, the quality matched the variety. Every article of produce I inspected at the Borough was pert, proud, and vibrant. Some of the herb bunches were so magnificently lush and green that they’d give Kew Gardens a run for the money. I didn’t spy a single limp leaf or wrinkle anywhere it didn’t belong. The third — and perhaps the most compelling — joy of the Borough was its absolutely stellar on-the-spot, instant-gratification snacking options. Before finishing, I had feasted on oysters with mignonette; grilled scallops with bacon and Savoy cabbage; coriander crêpes; bacon-Cheddar-leek tart; grilled lamb kebab on flatbread with insanely peppery rocket (arugula, to us Statesiders), roasted sweet peppers, chopped tomatoes, garlic-yogurt sauce, and feta; apple-rhubarb cider; fresh Flour Power bread with smoked garlic butter; a handmade lime-ginger lollipop; and a Lamington (a square of sponge cake split and filled with jam, then coated with a thin layer of chocolate and toasted coconut). Having eaten enough for any four hungry people, I had to belch “uncle!” and stop far, far short of the possibilities. It was either that or the emergency room. Back at home I returned over and over again to the memory of that lamb kebab sandwich, so I came up with my own version — with one major change. Because I prefer thin slices of meat to big chunks, I switched the lamb from the more customary kebabs to grilled boneless leg. This is a recipe where great ingredients will really shine, so if you have the option, choose a creamy French or Greek feta and tomatoes and arugula from a farmers market (or your own back-yard garden, if you can swing that). Prep the lamb: If the lamb is rolled and tied, cut off and discard the twine and unroll the meat. With a sharp, thin-bladed knife, trim the fat, gristle, and silver skin, and cut small slits all over the meat. Fill the slits with the garlic slices, sprinkle the meat evenly with about 1 tablespoon salt, and set it aside for 1 hour. Cook the peppers: Cut off the very tops and bottoms of the peppers and remove the cores and seeds. Cut the pepper bodies into wide, relatively flat planks, pressing to flatten if necessary. Prepare a two-level medium-hot fire in a charcoal grill or preheat a gas grill on high for 15 minutes. (If using gas, adjust the burners to medium-high.) Grill the pepper pieces skin-side down until the skin is charred and puffed, about 12 minutes. Place the charred peppers in a large heat-resistant bowl, cover, and steam to loosen the skins, about 10 minutes. Peel the peppers and slice into ½-inch-thick strips (you should have about 1½ cups). Toss the pepper strips with 1 tablespoon olive oil, ¼ teaspoon salt, and pepper to taste, and set aside. Cook the lamb: Dry the lamb well with paper towels, rub with the remaining olive oil, and season liberally with pepper. Grill the lamb until the exterior is well-browned and the center is still pink and registers about 125 degrees for medium-rare, about 25 minutes (less time for small pieces), turning and moving to the cooler area on the grill as necessary to prevent scorching. (If using a gas grill, adjust the burners to medium and grill with the cover down.) Transfer the lamb to a platter or cutting board, tent loosely with foil, and rest 20 minutes. Slice very thin, against the grain and on the bias. 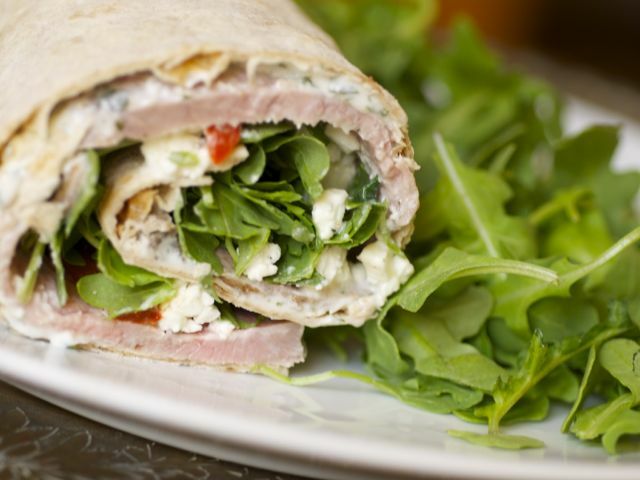 Assemble the sandwiches: Spread each sheet of mountain bread with about ⅓ cup yogurt sauce and top with a few slices of lamb, about ¼ cup each grilled peppers and feta, ⅓ cup chopped tomatoes, and a portion of arugula. Fold the bottom 1½ inches of the bread sheet up, then fold one edge over the fillings and roll, tucking and tightening as you go. Place the rolled sandwiches seam sides down on plates and serve at once.